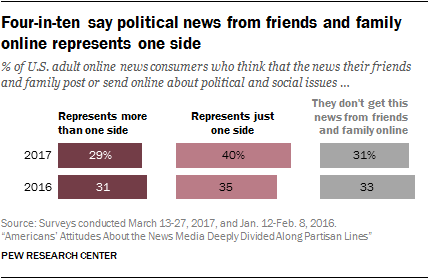 Partisan differences are evident not just in Americans’ news attitudes but also in their news practices. 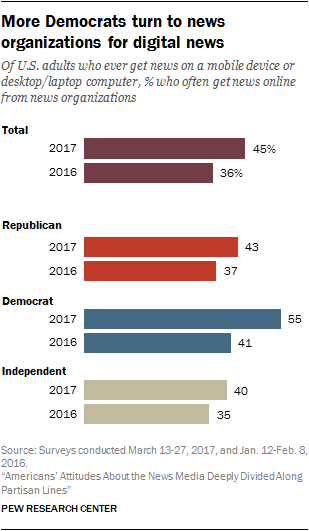 Interest in national news increased over the past year, with four-in-ten Americans now saying they very closely follow national news, compared with a third in 2016. The growth occurred almost solely among Democrats, whose rate of interest jumped 16 points from 33% then to 49% today. And it is older rather than younger Democrats who are paying closer attention. Sharp increases occurred among both Democrats ages 35 to 49 (from 26% who followed national news very closely in 2016 to 44% in 2017) and Democrats 50 and older (from 41% in 2016 to 63% in 2017), while there was no significant change among Democrats ages 18 to 34. Today, fully 45% of U.S. adults often get news on a mobile device. That is up from 36% in 2016 and 21% in 2013. The use of desktop or laptop computers for news remains steady, with 31% saying they do so often. Preference for mobile over desktop grew equally among both Democrats and Republicans. To get a better sense of the flow of news online, we asked those who ever get news on a digital device (whether on a desktop computer or mobile device) how often they get digital news from news organizations, from people they are close with and from people they are not close with. Among the three, news organizations sit at the top as a frequent source for online news and also experienced the largest increase from 2016. Nearly half of digital news users (45%) often get news from news organizations, up from 36% in 2016. As with interest in national news, this increase is driven primarily by Democrats (55% often get news this way today, up from 41% in 2016). No significant shifts occurred among Republicans or independents. Online news consumers were next asked to rate the accuracy of the news they get from each of those three types of sources (news organizations, people you know well and people you don’t know well). Democrats, who as noted are turning to news organizations online at higher rates than Republicans, also give these outlets higher marks for accuracy. A third of digital-news-using Democrats who turn to news organizations for online news rate this news as very accurate, compared with 8% of Republicans who get online news that way.4 There was also a wide gap in 2016, though not to the same degree (22% of Democrats who got news online from these sources versus 10% of Republicans). Republicans and Democrats did not differ in their accuracy ratings of the other two source types. Overall, among those who get news from each source, there were no significant year-over-year changes in accuracy ratings (full data available in the topline). The survey also asked about the degree of balance in the political news Americans get from family and friends online: Does it represent just one side, or multiple sides? Overall, 40% of Americans say their social circle posts primarily one-sided news. This represents a small rise from 2016, when 35% said this, with Republicans and Democrats equally likely to say this both years. All in all, then, news from one’s personal circle remains one area in which Democrats and Republicans largely agree and which saw little year-to-year change. 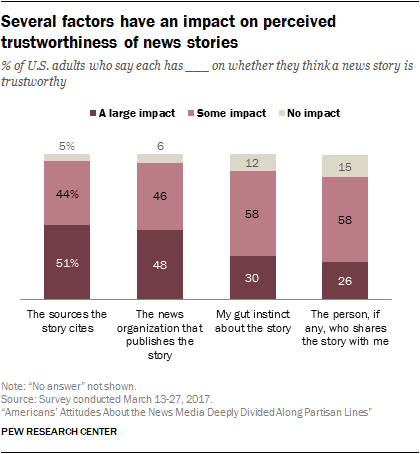 Among four possible considerations individuals could take into account when deciding whether or not a story is trustworthy, each has at least some impact among sizeable majorities of Americans. Two of the four, however, stand out as being more likely to have a large impact. About half of U.S. adults say the sources the story cites (51%) and the story’s publisher (48%) have “a large impact” on trust. Three-in-ten say their gut instinct about the story has a large impact, while about a quarter (26%) say they look to the person who shared the story as a major factor in determining whether they trust it. Democrats are more likely to give the sources a story cites a lot of weight in judging its trustworthiness (58%, compared with 48% of Republicans) and the same holds true for what news organization publishes the story (56%, versus 47% of Republicans). Both parties, however, have these two factors at the top of their lists. On the other hand, Republicans are more likely than Democrats to cite their gut instinct: About four-in-ten Republicans (38%) say this has a large impact, compared with about a quarter of Democrats (26%). Republicans rank “gut instinct” higher than the person who shared the story, while Democrats cite both as large impacts at roughly the same rate. Other data add nuance to these findings and suggest that who shares the story might sometimes be a larger factor in assessing accuracy than it appears here. Previous studies have shown that online news consumers are more likely to take a follow-up action (such as searching for more information) when a news story comes from a friend or family member than when it comes directly from a news organization, and that friends’ recommendations play a larger role than news outlets’ reputations in motivating someone to click on a link to a news story on Facebook.